The building was designed by James Howieson in 1988 as a purpose built Furniture and Art gallery, the aim was to design a “Margaret River” style building that was to utilise natural light and be a statement of timber and design. A residence for James, Anne and their two baby boys was to be built attached but to the rear of the main building, this was converted to gallery art display space in 1993. 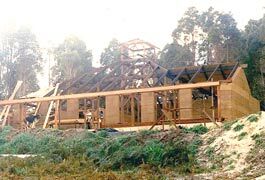 Construction of the 500square metre building began early 1989 with the objective to have it ready for Xmas trading. 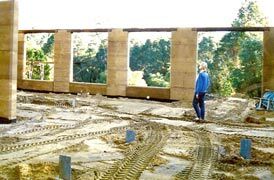 Of course the building had to be of rammed earth construction so a young and confident James purchased a bobcat and second hand ramming equipment, put a team together and began the walls. James had ambitions of a towering cathedral roof made from demolition wool store jarrah and to include a series of handmade arched timber framed windows around the perimeter. The salvaged timbers were sourced and dressed with his small workshop pumping out the specially designed windows and doors. 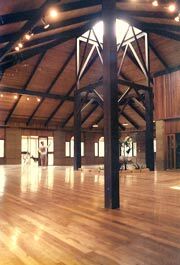 Ultimately six different species of timber were used throughout the building including Blackbutt floors, Jarrah, Karri, and Sheoak in the joinery and roof, Wandoo balustrade and a Western Red Cedar ceiling. It was a busy but productive year with the scheduled completion on time and the workshop frantically producing some pieces for the opening exhibition. The WA Premier at the time “David Parker” opened the gallery with a gathering of 100 family, friends and clients and trading began. This was a milestone for James and his wife Anne, they had begun in a tent with a single shed workshop and generator in 1987, moved into a rough shack built around a caravan by the end of that year and finally fulfilled their dream of a real residence and gallery in 1989. James Howieson had just received his diploma in Industrial design and was ensconced in his first year of teaching when he decided that he wasn’t doing what he really wanted to be doing. So he quit his job and started making Jarrah Burl Wood furniture from the backyard of his Scarborough property in Western Australia. Dedicated to a dream of making and selling his own furniture created from unique native timbers, he worked seven days a week, trekking down South for two days every month to sell his product to a loyal group of outlets he had established. The trips made him realise that not only was his heart completely in furniture design, but that living down south, amongst the surf and natural resources that he loved, was the next logical move. James sold his Scarborough property, bought some secluded land in Boranup and he and his wife Anne headed off from the city with all of their possessions in tow. Arriving in Boranup, they pitched a tent, assembled a workshop, dug a dam and cranked the generator up. 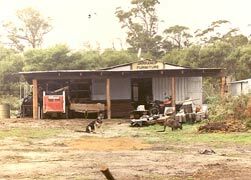 That was the beginning of Boranup Furniture – built in a forest on land stocked by mother nature with inspirational timbers and natural treasures that made James’ heart race. Although working tirelessly around the clock, James soon realised that he needed assistance, so his first apprentice was sourced locally and began to work alongside him. Two years later, an intense battle with the local shire to allow a gallery to be built on the property began. The shire deemed the place James had his heart set on as ‘too isolated’ for a work place, as there was no access through the 200m of National Park that divided it from the main roads. However James has never been the kind of person who takes no for an answer, especially with a life-dream on the line, so after some investigating into local records, he discovered a track alongside his property, winding through the forest and eventually intersecting nearby Caves Road. After winning the battle with the shire, construction of Boranup Gallery begun. James designed and owner-built the rammed earth gallery with his small team over the course of the following year, also designing and creating an attached home for his growing family. Twenty years ago, in December 1989, Boranup Gallery was officially opened by the Western Australian premier at the time, David Parker, at an event enjoyed by over 100 family, friends and clients. After the celebrations, a manager, cabinet-makers and part time staff were hired, and trading began. Today James and his team have trained over ten apprentices of which three remain, together with his original cabinet-maker Colin Smith, who now managers furniture production whilst producing intricate grandfather clocks that Boranup has become famous for. “After going through three other managers, I was introduced to a very confident Gi’Nelle Stammers when she was just 22,” says James. “She has been with us almost from the beginning, and her mother Jeanette joined the team soon after. The gallery has some part time staff and an indispensable bookkeeper called Rose. It’s a tight knit team that keeps the place running like clockwork,” he says. James’ driving philosophy is to handcraft products with superior design and finish, and to blend timber species of the south-west with the best hardware sourced worldwide. “Whilst expensive to produce and incredibly time-consuming, the results today are regarded as amongst the finest furniture coming out of Western Australia today,” he says with pride. To complement the furniture, souvenirs, art and sculpture of a similar high standard have been carefully selected over the decades, adding to the presentation and success of the gallery, which now represents over 150 artists from all over Australia. It’s the union of the artworks – both traditional and contemporary, subdued and startlingly vibrant, with the impressively large, natural wooden furniture that gives Boranup its unique, beautifully curated blend of pieces. The masses of fantastic colours that greet visitors when they step inside are awe inspiring. Set against the natural rammed earth walls and surrounded by the solid furniture, most people’s mouths hang open for a while as they become accustomed to the treasure trove of art and design hidden away in the middle of a towering forest. The attached Boranup Cafe with its forest outlook and fine food adds another dimension to the Boranup experience. Guests can sit out on the balcony enjoying morning tea and freshly baked scones, or relax and linger, choosing something from the ever-changing lunch menu. Native bird calls and the cool forest air create a place that is as far removed from chaotic city life as possible, yet the culture exploding from the gallery impresses even die-hard city slickers intent on finding sophisticated Australian art and furniture that speaks for itself. Ask James what his best memories are when it comes to having left a life of teaching and following his dream of being a designer living in the forest, and he has a thousand stories to tell. “The hard but wonderful years of pioneering the area…cutting the fence to the property and gunning the rental truck through the Bracken Fern as far as it would go, where it stopped and all our possessions were offloaded and the tent pitched,” he starts with. But it’s the stories in the trees that make his eyes really ignite with passion.